The career of a newspaper editor in Bangladesh is for you if you can ensure the written quality of print and online publications. Also, your duties will be included not only reading manuscripts but making sure that a writer’s formatting fits house style guidelines, correcting grammatical or factual errors and making suggestions for improvement. Apart from these, the duties of a newspaper editor to select articles or manuscripts for publication assist with design layout as well as overseeing other aspects of publication. Also, those who are editors they typically work closely with authors throughout the editing and publishing process. Despite being the job is very rewarding, with seeing their work come to final publication, you’ll find that there are many stressors involved as well. So, you should get and manage them as an editor. As a newspaper editor in Bangladesh, you need to be critical thinkers, effective communicators, and creative people. Although working as a newspaper editor can be stressful, this job boasts of numerous advantages. You’ll get benefit from good salary packages as it is different on the levels of editorial positions, such as copy editors, managing editors, editors-in-chief and senior editors. And because of his or her high rank in the editorial department and the nature of his work, the editor-in-chief is the highest paid newspaper editor. Also, when a newspaper editor works under minimal supervision, it enables him/ her to make independent decisions. Although a degree is not the first fact to become a newspaper editor in Bangladesh, with little-predicted job growth you increase your chances with at least a bachelor’s degree. Despite choosing English, journalism or communications, any liberal arts degree is a good choice, especially with a concentration in writing. Find other opportunities that will give you newspaper experience, such as working for the college while in college. Some employers will only hire graduates with a bachelor’s degree from a 4-year college or university while a 2-year degree from a community college can be enough for entry into the newspaper editing field. Apart from these, required degrees may include those in areas of communications, journalism, English, or creative writing. According to the Bangladesh Federal Union of Journalists (BFUJ) Secretary Omar Faruque, journalists were six steps behind government officials in terms of job prestige and salary. He also states that the salary for journalists stands at BDT 35, 875 at the special grade, but it’s BDT 12, 600 at the trainee level according to the 8th wage board. Whether in print or online a newspaper editor in Bangladesh is responsible for overseeing the quality of publications. For grammar and for factual accuracy, editors read manuscripts for conformance to the publication style. You need at least 6/7 years experience as a Senior Sub Editor to become a News editor. From reporters to the sub-editors and from there on to the Design team, this person is pivotal for the smooth transition of stories. Ensuring fine quality news and is second in line to the Resident Editor, he/ she plays the role of ‘Quality check’, and if required may re-write important or Page 1 story. So, you can assume that the job is not as easy as you’re thinking. It needs to get some specific education and other steps to be so. 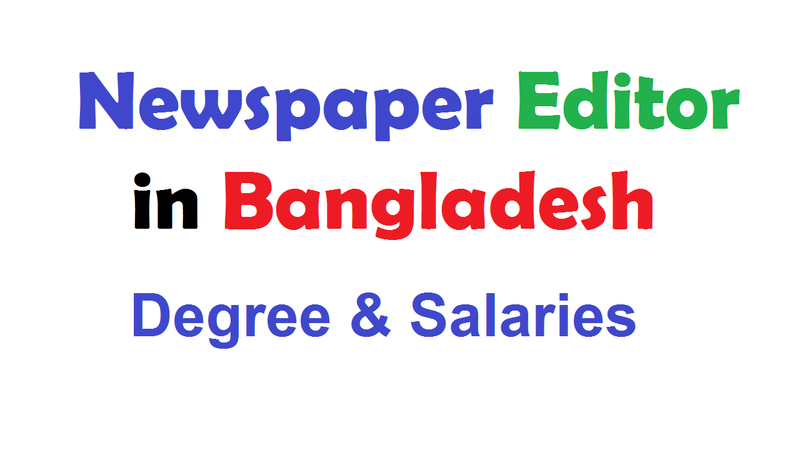 Well, let’s know the steps that are essential to becoming a newspaper editor in Bangladesh. Identifying and pursuing specific editorial work are the first step to becoming a newspaper editor in Bangladesh. As a prospective editor, you should identify what type of editorial work they wish to do. Fashion magazine editors, for example, should have an interest in fashion, whereas book editors should enjoy literature. And it may help prospective editors determine what training they need while identifying the industry in which one wants to work. Also, it influences the type of training a prospective editor might seek when you can understand the differences between content editing, copyediting, and proofreading. Because a large part of their jobs would involve revising content, whereas aspiring copyeditors may seek out additional grammar courses, individuals who want to be content editors may focus on honing their writing skills. Earning a bachelor’s degree is the second step to becoming an editor and a college education is required for most editing jobs. A bachelor’s degree in English, communications or journalism is often a prerequisite for one seeking to become an editor as it’s possible for someone who demonstrates strong writing and editorial skills to train on the job. Although students in these programs generally receive instruction on composition, sentence structure, and editing, advanced courses may delve into more specialized topics, such as news or content editing. But, it can be useful while acquiring an internship. Acquiring supplemental skills is the third step to becoming a newspaper editor in Bangladesh. Prospective editors also might take classes in computers, graphic design, and Web content management since most editing is done on a computer. It’s important for editors to have a working understanding of computers and editing software because more and more manuscripts are being submitted in electronic format. Including mass communications and TV production, students considering a career in editing for television may also consider enrolling in courses.